Each year, students in grade 7 Humanities study U.S. History and American Literature. 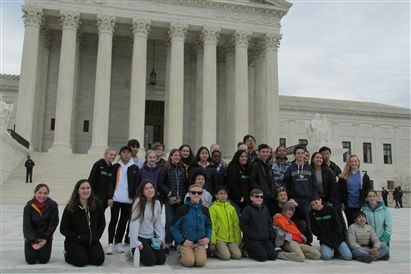 To augment their studies and provide them with an experiential learning opportunity, the school plans a 4 day trip to Washington, D.C. Students explore the historical, cultural, and social aspects of our nation’s capital in order to highlight many of the themes of the seventh grade humanities program. All students in the class attend this wonderful learning and social experience. In addition, four teacher chaperones accompany the students, and a tour guide provides insight into the city’s historical sites. The group flies from Boston to Baltimore, and the tour company provides a bus for transportation on the ground as well as evening security guards at the hotel where the students and faculty stay. On recent trips students have visited the White House; the Senate; the House of Representatives; the Library of Congress; the Lincoln, Jefferson, FDR, World War II, Vietnam War, and Korean War Memorials; the National Archives; the Smithsonian Institute museums; Ford’s Theater; the National Cathedral; the Newseum; the Kennedy Center; Arlington National Cemetery; Mount Vernon; Gettysburg; and the National Zoo. The trip presents students with an opportunity to learn about the U.S. government and culture and to develop self-confidence and self-discipline during this unique group experience. Click here to see details from the 2018 trip.